At our house, Daddy is in charge of bedtime, which he loves. 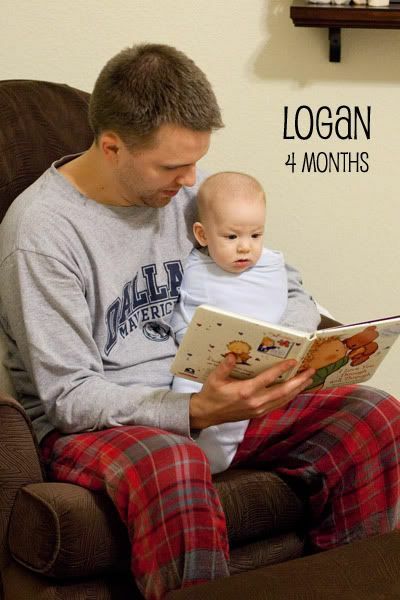 Right now, Logan goes to bed before Ethan, so here is daddy reading a story to him before putting him down for the night. He is swaddled right now for naps and bedtime because he rolls over and constantly wakes himself up. For now, it works. 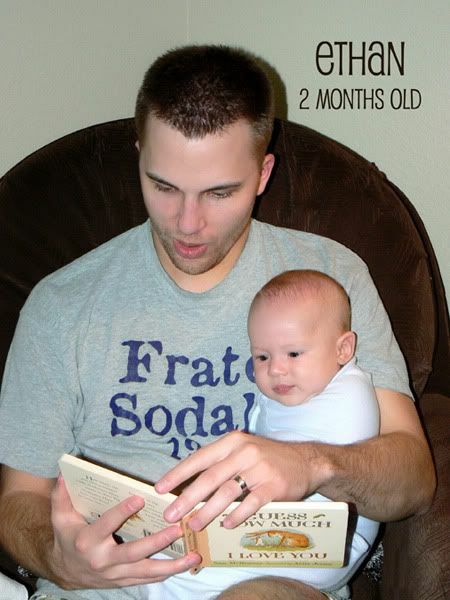 When I was taking that photo, I immediately thought of another photo that I took over 2 years ago...Daddy reading Ethan a story at bedime when he was 2 months old. So cute!!! They are both adorable, and, I think, both look so different! I see so much of Casey in Ethan and you in Logan! Both very lucky (and good looking!). That is so cute. I love Guess How Much I Love You. Such a great book. That's cool that Logan still likes to be swaddled. Brennan won't even think of it right now, unless he's completely asleep; Ashton was the same way for some reason. Yay for bedtime stories! I love the comparisons between the two pictures of your boys at bedtime.